The new Infiniti Q50 offers a clean and sleek look for 2014. The newer model includes innovative technology, enhanced drivability, and an improved cabin design. It is important to add that the Q50 is a more refined and improved version of the G37 and G25 sedans. This model offers an original style with a few creative features. 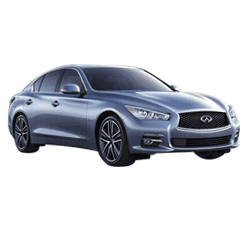 The 2014 Infiniti Q50 serves as the premier naming strategy for Infiniti. This is the first passenger vehicle to display the “Q” designation. Although the Q50 bears a different designation; the Q50 is a popular luxury sedan that is basically an improved version of the G25 and G37. Infiniti re-imagines the G37 with subtle character lines, a bolder snout, and smoother curves. The well-trimmed interior and 17-inch wheels provide an appropriate evolution to the G series. The Q50 kicks up the luxury a notch from the G series and offers a first-class automobile. 1) Performance - As standard, the 2014 Infiniti Q50 sports a powerful 3.7-L V6 engine with 328 HP. The acceleration offered from the Q50's powerful V6 engine is so strong that drivers mistake it for a V8. The vehicle offers increased drivability and a 7-speed automatic transmission. The transmission is finely calibrated to switch gears smoothly. 2) Fuel Economy/MPG - The Q50 offers an EPA-estimated 20/29 mpg city/highway. This is slightly above average for a V6-powered luxury sedan. The fuel economy for the Q50 has improved slightly from the G series. 3) Comfort and Quality - The Q50 offers a high-quality Infiniti sedan. This vehicle has a luxuriously designed cabin that incorporates rich materials such as wood accents and premium aluminum. The Q50 also offers comfortable seating and ample legroom. The largest interior change for the 2014 model is the attractive, down-sweeping center console that holds a large touch-screen. 4) Features - The Infiniti Q50 incorporates a new "InTouch" computer interface. This system includes smartphone app integration and a twin touch-screen display. The Q50 also offers two iPod/USB audio ports, Bluetooth phone connectivity, and a rearview camera. 5) Reliability - The Infiniti Q50 incorporates innovative features that improve the driving experience. There are currently a variety of new technologies that include improved safety features and enhanced driver settings. 6) Features - There are four different driver settings that offer quicker response times and improved steering. The Drive Mode Select feature helps drivers select a driving personality that is suitable for specific on-the-road conditions. The Mode Select feature offers a Standard, Sport, Eco, and Snow driving mode. There is also a Personal Mode that allows the system to adjust shifting patterns. This feature adjusts the throttle’s sensitivity and the vehicle’s Direct Adaptive Steering capability. 7) Comfort and Quality - This vehicle offers increased interior space. Infiniti has reduced the size of the front seats and increased the amount of space the seats can adjust. There is also a slight increase in cabin size that offers passengers in the back more room. Trunk space also received a boost from 13 to 18 cubic feet. 8) Luxury - The Q50 comes available with keyless entry/ignition, heated steering wheel, 17-inch alloy wheels, and automatic LED headlights. These features provide a luxury feel that comes standard on base models. 9) Safety - Safety technology offered by the Q50 include Active Lane Control. This feature allows the vehicle to correct steering as a result of road surfaces and conditions. The Active Lane Control uses an innovative camera system to adjust steering. 10) Safety - Other packages include an adaptive cruise control and a 360-degree parking camera. There is also a forward/back-up collision system that applies the vehicle's brakes before a collision occurs. Safety has received several improvements that include front/rear parking sensors and a blind-spot/lane departure warning system. 1) Many drivers rate the Q50’s ride quality below average. The Q50's suspension does not respond well to bumpy pavement. Some reviews suggest the ride of the sedan feels somewhat uneasy on roads that are not entirely smooth. In most cases, the ride of the Q50 is pleasant; however, there is a fidgety feeling that never goes away while traveling on the highway. 2) Overall, the handling of the Q50 is a concern for serious drivers. Many drivers are disappointed with the Q50’s handling capability. Reviews suggest that the steering lacks response and the "Sport Mode" driver setting feels stiff. In some cases, drivers complain that the brakes get too tight when coming to a complete stop. 3) Although the Direct Adaptive Steering (DAS) system is a beneficial feature; many drivers prefer standard steering. The DAS system is a feature that allows the driver to manage their steering effort and adjust the vehicle’s turning radius to a specific preference. Many drivers feel that the DAS system is effectively adjustable; however, the system feels simulated and disconnected from the highway. 4) Many drivers want a more frugal four-cylinder engine. Although this may not be an issue for many drivers; varying engine options have been a compliant for a few potential buyers. In some cases, drivers also complain about the steering and braking of the hybrid models. Infiniti has recreated the G37 and G25 sedans for a younger, more technological driver. The Q50 offers sophistication, style, performance, and innovation in this new Infiniti model. The Infiniti brand has grown significantly over the past decade. As a result, Infiniti has established itself as one of the premier automobile makers. The Q50 seats five passengers comfortably and boasts a powerful 3.7-liter, V6 engine. The base model comes standard with several luxury options such as keyless ignition/entry and leatherette upholstery. The base model also includes dual climate control and satellite radio. Although this is a luxury vehicle, it is moderately priced at around $37,050.